Recent decades have witnessed strong interest in Chinese women's literature, history, and culture of the Ming (1368-1644) and Qing (1644-1911) periods among scholars, researchers, and students in China, Taiwan, Hong Kong, North America, Europe, and elsewhere in the world. Chinese women's writings constitute a significant resource for ground-breaking research. They have opened up critical perspectives and enriched our knowledge of many aspects of Chinese culture and society. 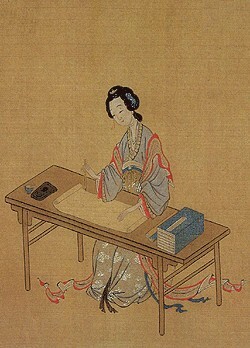 Close to 5000 collections of poetry and other writings by individual women are recorded for the Ming and Qing periods. However, less than a quarter of these materials have survived the ravages of history, and these have mostly ended up in rare book archives in libraries in China that are difficult to access. The Ming Qing Women's Writings digital archive and database project is dedicated to the digitization of collections of writings by women in late imperial China (1368-1911). The website was launched in 2005. The on-going project employs new digital technology to preserve and make accessible on the internet this valuable cultural legacy for future generations of scholars, researchers, and other interested publics, thus building intellectual and technological infrastructure and creating possibilities to generate new methodologies in the fields of digital humanities and China studies. The website consists of a virtual library augmented by the online scholarly apparatus designed and implemented by the McGill Library Digital Initiatives team. In addition, it features a link for each writer to the China Biographical Database hosted at Harvard University.